And I’m not talking about the monkey movie. Recent news in the veterinary health front has caused me to divert from my planned series on dental health. An outbreak of canine influenza has occurred in San Francisco, California and our dogs are at great risk!! You may be thinking, “How does this outbreak in California really affect me?” Most people do not know that as a whole, Oregon does not suffer from the same dog overpopulation problem that other states see, so a vast majority of the dogs that enter rescue groups and especially shelters, are transported from elsewhere, many from California. So any dog that recently cam from a shelter or rescue could potentially have been a transport from California, thus they may be spreading this highly contagious disease. 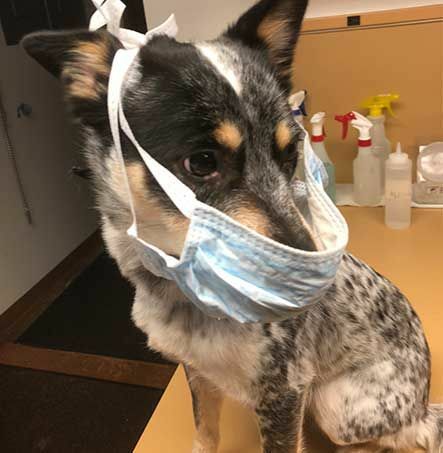 Though the overall mortality rate for influenza is quite low (less than 10%) it is estimated that about 80% of the dogs exposed to the disease develop clinic signs (and a small population may not show signs but continue to spread the virus). Before I go into details about canine influenza, here’s a little history lesson. Canine flu outbreaks in the U.S. are actually a fairly recent occurrence, the first on record occurring in Florida in racing greyhounds. The strain in that outbreak was identified as H3N8, a mutated equine influenza virus. Since that initial outbreak, the disease has been seen in almost all 50 states. A second strain of the disease popped up on our radar in Chicago, causing an outbreak in shelter dogs (and even some cats!). That outbreak was linked to the H3N2 strain, only before seen in various parts of Asia, mostly in South Korea, it is speculated to be a mutated bird virus. The incubation period (time from exposure to clinical illness) is usually 1-5 days. The worst part about influenza is that even during this period when dogs are not showing any signs of illness, they are spreading the disease and are in fact at the most contagious. Common signs of influenza infection are like those of any other respiratory type disease, cough, nasal and ocular discharge, lethargy and sometimes fever. Because the virus injures the cells lining the respiratory tract, dogs are also prone to secondary bacterial infections that can become severe cases of pneumonia, though severe disease is typically uncommon. Clinical signs generally persist for 10-21 days. So who should be concerned? EVERYBODY! Specifically though, dogs at a higher risk would be those that attend day care or training classes, go to the groomer, are boarded, or even just go to the dog park. The virus can live for about 48 hours on surfaces and as much as a day on skin and clothing, so a dog just touching their nose/muzzle to another dog, breathing in infective droplets and contacting a surface touched by a sick or shedding dog (like a simple water bowl or a rope toy) can catch the flu. Just like I love to say, prevention is key. If dogs are in any of the risk groups, have pre-existing heart and lung disease, or are elderly, they should be vaccinated. Both strains are combined into one vaccine, or each strain can be given separately. Just like some other vaccines, the flu vaccine does not prevent the possibility of disease 100%, but has been shown to decrease the duration and severity clinical signs if dogs become infected. The vaccine is started as a series of two and is boosted every year. If you or someone you know is interested in protecting their pet from influenza- call Four Corners Animal Hospital today! !